To understand the significance of the award, it must be viewed in the context of the 1982 Unclos. Unclos is generally regarded as one of the major achievements of the United Nations system. It purports to establish in one complex treaty a legal order for the seas and oceans that takes into account the needs and interests of all states by promoting the peaceful uses of the oceans, facilitating international communication through navigation and overflight, establishing rules for allocating and managing the natural resources of the oceans, and establishing rules for protecting and preserving the marine environment. The 1982 Unclos was negotiated as a "package deal". To obtain rights to explore and exploit resources, coastal states had to accept obligations to protect and preserve the marine environment, and to cooperate to sustainably manage the living resources. The representatives of states negotiating the Unclos understood that disputes would inevitably arise between state parties on the interpretation and application of its provisions. This is especially so since the negotiators were able to reach a consensus on some controversial issues only by agreeing to "deliberately ambiguous" language. Also, the negotiators were aware that states would inevitably interpret the provisions in Unclos to maximise their national interests and in the light of their particular cultural and historical circumstances. Consequently, the drafters included as an integral part of the "package deal" the most complex dispute settlement regime ever devised in an international convention. When a state becomes a party to Unclos, it agrees in advance to a system of compulsory dispute settlement that can result in a final and binding decision by an international court or arbitral tribunal. In essence, Unclos provides that if a dispute arises between two state parties that cannot be resolved by negotiation and exchange of views, either of the parties to the dispute can unilaterally institute proceedings before an international court or arbitral tribunal without obtaining the consent of the other party. The Philippines initiated the arbitration proceedings on Jan 22, 2013. Although China decided that it would not appear or participate in the proceedings, the arbitration proceeded in its absence in accordance with the provisions of Unclos. After almost three years of proceedings, the five-member tribunal issued its award on jurisdiction on Oct 29 last year. A hearing on the merits of the case was held late last November. The award on the merits was issued on Tuesday. The awards on both jurisdiction and the merits were by a unanimous decision of the five members of the tribunal. The tribunal found that some of China's actions in the South China Sea were contrary to its obligations under Unclos and, in some cases, were an infringement of the rights of the Philippines. However, the tribunal noted that as a matter of principle, both China and the Philippines have accepted Unclos and the general obligation to comply with its provisions in good faith. The tribunal stated that the root of the disputes at issue between the Philippines and China lies in fundamentally different understandings of their respective rights under Unclos in the waters in the South China Sea, and not in any intention by one of the parties to infringe the rights of the other. It can be argued that this has indeed been the essence of the problem. Although China participated in the nine years of negotiations leading to the adoption of Unclos, and became a party to Unclos in 1996, China has interpreted and applied the provisions of the Unclos in the light of its own historical and cultural traditions. China seems to have been unable to understand that Unclos was intended to establish a universal body of rules that is to be interpreted and applied by all state parties in the same manner, notwithstanding their historical and cultural traditions. For example, China did not seem to understand that Unclos provides that coastal states have the sovereign right to explore and exploit all of the living and non-living resources in the 200-nautical-mile exclusive economic zone (EEZ) measured from their mainland coast, and that it was not compatible with the Unclos for China to assert "historic rights" to resources in the EEZ of other states based on its "nine-dash line" map. South China Sea: Who claims what, and on what basis? China's claim to historic rights within the nine-dash line, within the EEZ of the Philippines, was the major reason the Philippines instituted proceedings. Therefore, it was a major victory for the Philippines when the tribunal ruled that, to the extent that China claimed historic rights to resources in the waters inside its nine-dash line, such rights were extinguished when it ratified Unclos if those waters are now within the EEZs of other coastal states. The Philippines did not raise any issue with respect to which state had a superior claim to sovereignty over the islands in the South China Sea. This is because an arbitral tribunal established under Unclos can only consider disputes on the interpretation or application of Unclos, and Unclos contains no provisions on how to resolve sovereignty issues. Therefore, the award of the tribunal does not address the underlying dispute in the South China Sea - the competing claims to sovereignty over the islands. Further, although the tribunal found that China's claim to historic rights in the nine-dash line is not compatible with Unclos, it did not rule that the nine-dash line per se is illegal or invalid. China is under no obligation to formally denounce the nine-dash line. The nine-dash line is still relevant because it shows the location of the various islands in the South China Sea over which China claims sovereignty. The difference is that as a party to Unclos, China can claim sovereignty only over those islands that meet the definition of an island in Article 121 of Unclos, that is, naturally formed areas of land surrounded by and above water at high tide. What the Philippines did assert was that there were disputes between China and the Philippines on the status and entitlement to maritime zones of the reefs occupied by China. In its award on jurisdiction, the tribunal held that it could consider these issues without considering who had the better claim to sovereignty over the reefs in question. The Philippines admitted that several of the reefs occupied by China were "islands" as defined in Article 121 of Unclos because they were naturally formed areas of land surrounded by and above water at high tide. This meant that they were subject to a claim of sovereignty and entitled in principle to maritime zones. However, the Philippines further asserted that none of the islands in Spratlys that were occupied by China was entitled to more than a 12-nautical-mile territorial sea. The Philippines maintained that the islands occupied by China fell within the exception in Paragraph 3 of Article 121, which provides that "rocks which cannot sustain human habitation or economic life of their own are not entitled to an EEZ or continental shelf". Most observers believed that this was the most difficult issue facing the tribunal. The tribunal examined the language of Article 121(3) in great detail, and in what is perhaps the boldest part of its decision, it ruled that none of the disputed islands in the Spratly Islands is an island entitled to an EEZ and continental shelf of its own. The tribunal held that even Taiping, the largest natural island that is occupied by Taiwan, is a "rock" that is not entitled to an EEZ or continental shelf of its own because it cannot sustain human habitation or economic life. The impact of the decision that all of the islands in the Spratlys are rocks entitled to no more than a 12-nautical-mile territorial sea should not be underestimated. It means that there are no areas of overlapping EEZ claims in the EEZ of the Philippines. Consequently, the Philippines has the exclusive right to develop the oil and gas resources in Reed Bank, the area off its coast which has the greatest potential for hydrocarbon resources. Exploitation of this area has been held up because China claimed a right to the resources because the area is within its nine-dash line. This decision of the tribunal is also of great significance to Vietnam, Malaysia, Brunei and Indonesia. Given that the tribunal has ruled that China has no historic rights to resources in the EEZs of other states within the nine-dash line, and that none of the disputed islands is entitled to an EEZ of its own, it means that China has no legal basis under Unclos to claim that it has a right to share the fishing or hydrocarbon resources in the EEZs of the Asean claimants bordering the South China Sea. Although the tribunal found that China's claim to historic rights in the nine- dash line is not compatible with Unclos, it did not rule that the nine-dash line per se is illegal or invalid. China is under no obligation to formally denounce the nine-dash line. The tribunal also agreed with the submission of the Philippines that several of the reefs occupied by China were low-tide elevations rather than islands. Consequently, they are not subject to a sovereignty claim unless they are within 12 nautical miles of an island, and they are not entitled to any maritime zones of their own. 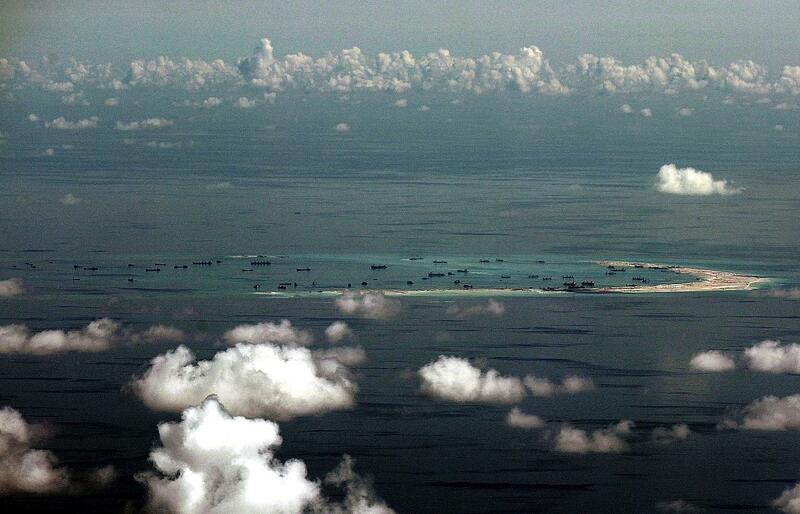 The tribunal's decision on Mischief Reef is particularly troublesome for China. The tribunal ruled that Mischief Reef is a low-tide elevation, not an island, and that it is located within the EEZ of the Philippines. Therefore, under Unclos, the Philippines has jurisdiction and control over the Mischief Reef, and it has the exclusive right to authorise and regulate the construction, operation and use of installations and structures on the reef. Consequently, the tribunal ruled that the installations and structures built by China on Mischief Reef are legally under the jurisdiction and control of the Philippines. The tribunal also held that the Second Thomas Shoal is a low-tide elevation within the EEZ of the Philippines. This is the reef on which the Philippines intentionally stranded a vessel in order to try to prevent China from occupying it. As a result of the award, this reef is legally under the exclusive jurisdiction of the Philippines, and any actions by China to interfere with the resupply of the vessel would be unlawful. The award of the tribunal is also important for what it says and does not say regarding China's construction activities (island building) in the Spratly Islands. First, the tribunal made it clear that China's land reclamation activities were in violation of its obligations to protect and preserve the marine environment, including its obligations to conduct an environmental impact assessment (EIA) for planned activities in accordance with international standards, and to make the results of the EIA available. Given that the tribunal has ruled that China has no historic rights to resources in the EEZs of other states within the nine-dash line, and that none of the disputed islands is entitled to an EEZ of its own, it means that China has no legal basis under Unclos to claim that it has a right to share the fishing or hydrocarbon resources in the EEZs of the Asean claimants bordering the South China Sea. Second, the tribunal held that the construction activities were unlawful because they aggravated and extended the ongoing dispute that was before the international tribunal. In addition, China's construction activities destroyed evidence of the natural condition of the features in question, even though the status of such features was a matter pending before the tribunal. Third, it should be noted that the tribunal did not rule that it was unlawful in principle for China to undertake construction activities on the disputed islands that it occupies. Also, the tribunal did not discuss whether it was lawful for China to change the status quo in the South China Sea by building airstrips and other facilities on the islands it occupies. There are no provisions in Unclos on these issues, and the Philippines made no argument that the construction activities were in principle contrary to the provisions of Unclos. Fourth, there is nothing in the decision which would make it unlawful for China to construct military installations on the islands it occupies, with the exception of Mischief Reef. It should be noted that the tribunal did not rule that it was unlawful in principle for China to undertake construction activities on the disputed islands that it occupies. China's initial reaction to the award has not been unexpected. It has stated that it does not recognise the legitimacy of the award and that the award will be treated as null and void. In practice, however, the award will be a "game changer". The award has not only clarified in several ways how Unclos applies to the complex disputes in the South China Sea, but it has has also brought home to all concerned the importance of Unclos in establishing a rules-based order for the oceans and seas, including the South China Sea. The Asean claimants and Indonesia can be expected to strongly support the decision as its reasoning applies equally to their EEZ claims. They will strongly oppose any attempt by China to assert a right to the natural resources within their EEZs on the basis that it has historic rights within the nine-dash line. The award ensures that the waters in the South China Sea outside the 12-nautical-mile territorial sea from the islands will be open to all states to exercise freedoms of the high seas, including overflight, navigation and military activities. This will be welcomed in particular by the United States and its allies in the region. States concerned with the importance of a rules-based order for the oceans will point out that the award is final and binding, and call on China to carry out its activities in accordance with the award. However, such calls will appear hypocritical if those same states do not first reflect on the implications of the award on their own claims and activities. Observers will be quick to point out that states such as Japan and the United States currently claim an EEZ from islands which according to the tribunal's interpretation of Article 121(3), are rocks entitled to no more than a 12-nautical-mile territorial sea. Also, the United States should refrain from criticising China for not participating in the case and implementing the award until it becomes a party to Unclos and is itself subject to the system of compulsory binding dispute settlement set out in the Unclos. Finally, the reasoning in this case is likely to have an impact on the development of a rules-based order for the oceans whether or not it is strictly complied with by the parties in the case. As an authoritative interpretation of Unclos by eminent law of the sea experts, the award will be studied by law students and government legal advisers for years to come. •Robert Beckman is the Head of the Ocean Law & Policy Programme at the NUS Centre for International Law as well as an Associate Professor at the NUS Faculty of Law.